February 22 is “Cat Day” in Japan. 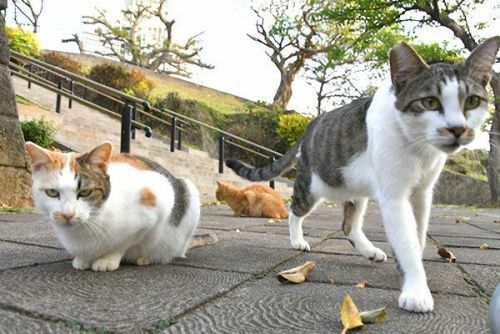 Naha City is home to “Community cats,” which are fed in Machiguwa or local shopping areas and streets. The city government plans to implement Trap Neuter Release/Return (TNR) of stray cats all around the city from the fiscal year of 2017. Naha city used to confine the area for TNR to tourist spots. However, many people continue to intentionally abandon their cats in areas where TNR is carried out or “Community cats” are well treated. Since the fiscal year of 2014, Naha city has been carrying out a state-subsidized project to do TNR specifically in areas around tourist spots as part of tourism promotion. According to the Environment Sanitation Division of the city government, TNR has been carried out for 625 cats over 3 years. Since the number of cats has decreased in the areas around tourist spots, the city government plans to implement TNR in residential areas. On Sakurazaka Street in the city, shops located along the street are taking care of “Community cats.” Because cats are seen relaxing in the street, the area has become popular with cat lovers. However, many people continue to abandon their cats on Sakurazaka because they think people treat them well there. Concerned about preventing strays and unwanted cats and dogs from dying, Motoko Hatakei rescued a kitten abandoned in the street. Hatakei said, “Please don’t abandon cats. If you own cats and dogs, you have to take responsibility and take care of your pets until they die.